Set in a sterile, upmarket wine bar in 1981, Lyndsay Turner’s Lyttelton revival stages the scene with suitably epic scope. Guests include apocryphal woman-posing-as-man Pope Joan (Amanda Lawrence), 19thcentury English explorer Isabella Bird (Siobhan Redmond) and Lady Nijo (Wendy Kweh) concubine to the Japanese emperor until she became a Buddhist Nun in 1283. Conversation ebbs, flows and overlaps as Marlene plays host, celebrating her promotion to managing director of the Top Girls employment agency, taking her place within a historical tapestry of female ambition against patriarchal restrictions. After setting a tone of widescreen possibility, the play then relocates us to a cramped Suffolk basement to show us Marlene’s sister, Joyce (Lucy Black) and 15-year-old niece, Angie (Liv Hill) the stage contracting to a narrow box, effectively highlighting the division of opportunity between these two worlds. The contrast is repeated when we are introduced to Marlene’s expansive office floor, then to Joyce’s modest kitchen, where long standing familial tensions reflect a country torn apart under Tory government. Unobtrusive direction allows characterisation to flourish, Kingsley’s formidable Marlene remains likeable even at her most scathing and judgmental, providing regular glimpses of the vulnerability behind her shield of strident independence. Kingsley hints that underneath the glittery shoulder pads and drive for success, Marlene might be more conscious of the true cost of her dog-eat-dog attitude than she cares to admit. 17 year old Angie represents the collateral damage of Marlene’s quest to succeed and Liv Hill’s interpretation is a highlight. Angie is a naive bundle of awkward energy in physicality and delivery. Hill achieves a pin point depiction of teenage neediness, both humorous yet tragic, particularly when she makes an unannounced visit to her Aunt’s workplace. In this tense and eye-opening scene, the gulf between her and Marlene couldn’t be more pronounced. 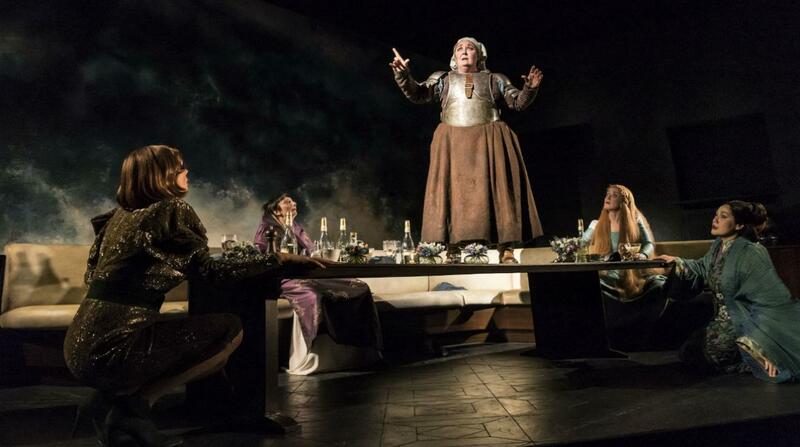 I never realised just how funny the play is, and the cast deserve much credit for consistently finding humour without diminishing any of Top Girls’s emotional weight and political punch. Any theatre studies undergrads out there will likely have heard many a time of Churchill’s knack for uniting the personal and the political. Top Girls certainly provides plenty of cogent insights into the pressures individual women face while navigating working life and the individualist ideals of the era. The exchanges between the agents at Top Girls and their prospective clients go far in illuminating the complex, and still relevant intersections between class and gender, and the cost of professional ambition for many women. This staging is also notable for being the first not to utilise doubling (actors playing multiple parts) in this case every role is played by a different actor. In her programme note Churchill states that this was always the intention, and early casts were limited by necessity. I must say I miss the extra layers of meaning that arise from doubling, and in the context of recent observations of gender imbalance on The National’s stage, I wonder whether this decision was genuinely a creative one.